From the head of Google's innovative People Operations comes an inquiry into the philosophy of work - and a blueprint for attracting the most spectacular talent to your business and ensuring that they succeed. Drawing on the latest research in behavioral economics and a profound grasp of human psychology, Work Rules! provides teaching examples from a range of industries - including lauded companies that happen to be hideous places to work and little-known companies that achieve spectacular results by valuing and listening to their employees. Laszlo Bock, head of People Operations at Google, once interviewed a job candidate who was clearly wearing a new and quite expensive pinstripe suit purchased just for the interview. Bock told the candidate that he had good news and bad news. The good news was that he was hired; the bad news is that he would never wear that beautiful suit again. 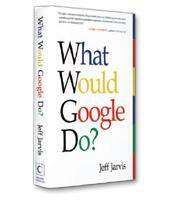 Googlers, as the 50,000 employees of Google are called, do not wear suits. However, casual clothes is just one (rather minor) facet of a progressive working environment that has allowed Google to win numerous Great Place to Work awards, not only in the United States but in countries around the world. 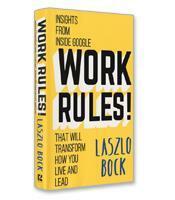 In his book Work Rules: Insights from Inside Google That Will Transform How You Live and Work, Bock details how the company recruits, motivates and manages the highly talented people who join the company. For Bock, a “high-freedom approach” to managing people is key, as compared to the low-freedom command-and-control approach of traditional companies. For example, in addition to mission (Google’s succinct mission statement is “to organize the world’s information and make it universally accessible and useful”), the cornerstones of Google’s culture are transparency and voice, he writes. While many companies insist they champion full transparency of the company’s operations and giving their employees a voice, Google translates the words into unequivocal, on-the-ground action. For example, one would expect that Google would carefully guard its code base — the collection of source code that contains, Bock writes, “the secrets of how Google’s algorithms and products work.” In most software companies, new engineers can see some of the code base for just their product. “At Google, a newly hired software engineer gets access to almost all of our code on the first day,” he writes. The issue is trust, he explains. If you trust your employees, there is no reason not to be transparent and not to let them guide decisions. Each chapter ends with two to four of these succinct work rules that encapsulate the core lesson of the chapter. These work rules are listed at the end of the book, creating perhaps one of the most comprehensive guides to managing people ever gathered in four short pages. Some of the work rules are progressive but not surprising. The work rules for selecting new employees, for example, are set a high bar for quality, find your own candidates, assess candidates objectively and give candidates a reason to join. Other work rules may be more unexpected. The rules for compensation begin with “Swallow hard and pay unfairly. Have wide variations in pay that reflect the power law distribution of performance.” In other words, it is often assumed that employees at a certain level should make approximately the same amount of compensation, with some slight adjustment for performance. However, the contribution that employees make to the company will vary greatly from employee to employee. Studies show that the top 1 percent (in performance) of workers generates 10 times the output of average workers. Employees, Bock writes, should be compensated accordingly. While there are numerous books about Silicon Valley management methods, Work Rules offers both an in-depth exploration of the workings of the iconic company’s HR efforts and policies and a take-away list of practical to-dos valuable to the HR functions of any company.